The summit was a two-day conference aimed at providing attendees the tools to put pressure on their elected officials to remove Trump from office. 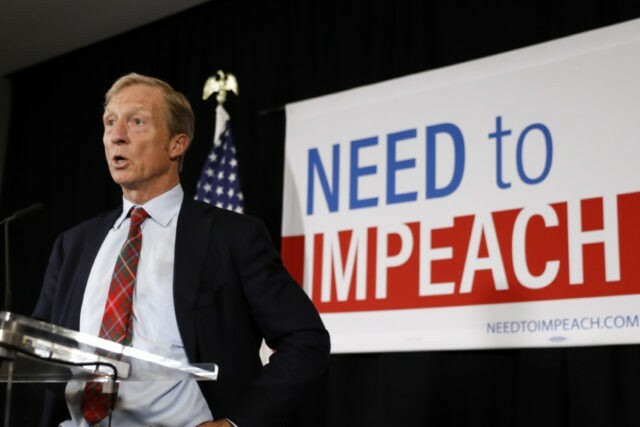 The conference is part of Steyer’s “Need to Impeach” campaign, which he began bundling money for after the 2016 presidential election to convince elected Democrat lawmakers to impeach Trump. Steyer recently purchased $435,000 worth of television advertisements in Iowa pushing for Trump’s impeachment as part of a $2.5 million ad buy targeting the first four presidential primary states in 2020— including Iowa, New Hampshire, Nevada, and South Carolina. The left-wing environmentalist billionaire specifically targeted freshman Democrat representatives in the House, including Rep. Cindy Axne (D-IA) and Rep. Abby Finkenauer (D-IA). But Steyer lamented that he may be alone in his crusade to find left-wing politicians willing to go through the process of impeaching Trump, as many prominent Democratic 2020 hopefuls— including Sen. Kamala Harris (D-CA) and Sen. Kirsten Gillibrand (D-NY)— have not said outright that they would support impeaching Trump over the past few months. “I don’t know how many millions Tom Steyer has spent on television at this point on the subject of impeachment, but it’s a lot of millions, right? And I don’t sense any moving of the needle because of it,” Jerry Crawford, a Democratic Party operative and Iowa lawyer told Politico. “It just sounds like more partisan bickering to the public, which essentially has zero tolerance level for that,” he added. Steyer recently decided not to run for president in 2020, keeping his focus on fundraising for Democrat candidates and holding lawmakers “accountable” if they refuse to impeach Trump at every turn.